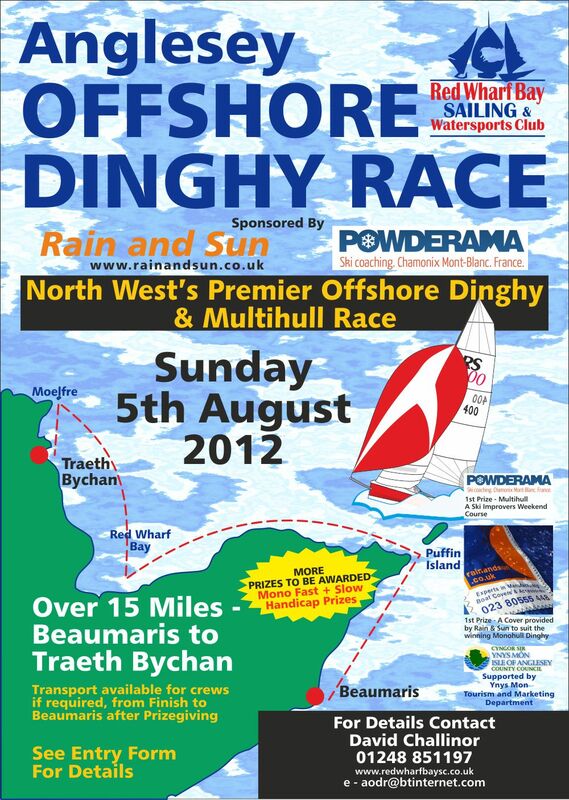 Last weekend Chris and I attended the Island of Anglesey Offshore Race. This race is for all classes of dinghy either mono hull or multi hull and runs from Beaumaris on the Menai straits through Penman point and then on to Traeth Bychan some 15 miles away. It is an area of stunning beauty and is a fantastic place to sail. The Vision is a great boat to sail and we were really looking forward to it. Unfortunately over the preceding week my right shoulder has developed Tendinitis that is really painful so I had to step down and Chris sailed with Andy, one of our other instructors instead. Whilst launching the boats the sky went black, gave forth thunder and lighting and then the heavens opened up. It rained so hard it began to fill the boats with water. Luckily dinghy's are used to having water come into them and so have bailers in them to extract the water whilst under way. We were really lucky the lightening did not come any where near them. During all this the wind dropped away to nothing and so the race started with a drifting fleet. The really light winds make for slow progress. The island in the photo above is Puffin island, home to a large colony of Puffins. It is a bird sanctuary now and you can only see the birds by boat. There are regular boat trips from Beaumaris to see the Puffins and you can probably make out some in the photo if you look close enough. Eventually the rain stopped, the sun peeked through the clouds and the fleet started to pick up some wind all be it a zephyr of a breeze. After 4 hours of sailing Chris eventually made it to Traeth Bychan and enjoyed a good meal and drink. Whilst they won no prises they did enjoy the sailing. We all had a great weekend despite the weather and are exhausted. We had 8 boats enter the race and all came home safe and sound. Quick update on AmyJo. Spoke with Jim at Alexander boats and he is finishing off a hull over the couple of weeks. AmyJo will be next and he will let me know when the base plate will be laid so we can be present. So hopefully we should have something tangible to show you of the build soon. Well thats all for now, hope you are all enjoying what little summer we seem to be having. Hopefully the weather forecasters are right and the promised warm weather turns up at the end of the week.